Several years ago, Nubs was living in a remote border fort in Western Iraq when he developed a relationship with members of a U.S. Border Transition Team stationed there — in particular, Major Brian Dennis. Nubs: The True Story of a Mutt, a Marine and a Miracle chronicles the story of what happened when Major Dennis was forced by Nubs’s devotion to reject acceptance of the status quo and seek a compassionate, happy ending for the animal. 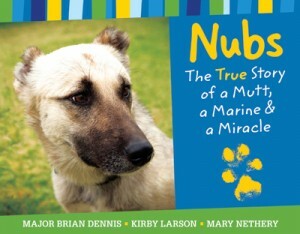 Nubs was the leader of a wild pack of dogs who survived in very primitive conditions, eating rats and scraps of food. His ears were cropped to make him a “dog of war.” As part of the BTT’s duties, Major Dennis and his team regularly visited the fort where the dogs lived and had many interactions with Nubs and his pack. Often, when the BTT left for its next destination, Nubs would run behind the Humvees, following them for as long as he could. One day, Major Dennis and his team arrive at the fort to find that Nubs has been stabbed and is very ill. They nurse Nubs to the best of their ability but their time at the fort is brief; they soon leave for their next stop. What happens immediately afterward is the crux of the story: though Nubs is too weak to run after the Humvees for long, he treks through the desert for two days, slowly following the path of the BTT. After traveling about seventy miles solo, Nubs finds the BTT at Iraqi battalion headquarters, shocking them all with his arrival. Major Dennis orders his BTT to head the final half-mile to their own Command Outpost, and there they all enjoy indulging Nubs (including making him a doghouse and a collar), until other soldiers sound the alarm that there is an unauthorized dog living with the team. Told he needed to get rid of Nubs (which might have seemed impossible, given recent events), Major Dennis and his team quickly raised funds and pulled together a canine transport to the U.S. through Jordan. Nubs eventually landed in San Diego, where he stayed with friends of Major Dennis’s until the major returned from Iraq and the two were reunited. We don’t have any active military members in our circle of close friends and family right now, so this book is an eye-opener for those who may have kept their children fairly sheltered from current events in the Middle East or various aspects of military life. If your family finds itself in the same position, and has curious minds processing this story, then prepare for a LOT of questions about the workings of the military, why the Humvees have names, why the soldiers are in the desert, why Nubs had his ears cut off and was stabbed, what MREs are and why soldiers eat them, why the rest of the dogs in the story didn’t have a home, why they weren’t all sent to the U.S. as Nubs was, why Nubs had to travel so far through the desert to be with Major Dennis, why soldiers are not allowed to have dogs and so on. We trace the journey of these two friends not just through the text of the book but through its photographs as well. There are many wonderful pictures of Nubs and Major Dennis in Iraq and at home in the U.S.; my favorite comes at the end of the book when Nubs and Major Dennis are reunited. The body language of both radiates pure joy. Parents may want to note that there are some photos of a rather miserable looking Nubs that accompany the text surrounding the description of his stabbing and subsequent illness, however, they are not graphic. The book also contains snippets of emails that Major Dennis sent to family and friends, which add interesting insight into the two’s journey. The story is incredibly compelling, and in fact, not only did Major Dennis and Nubs make the rounds a couple of years ago on a variety of shows (including vegan sweetheart Ellen), but the story is slated to be made into a major motion picture. Underestimating the power of a heartwarming story, Major Dennis had initially written to his family that he didn’t think he’d ever write a book. This book opens the door for some tough questions for and from young animal lovers. I recommend this for ages 5 and up.